A devastating opening to the second period of play by Glasgow based side Whitecraigs left Falkirk with a mountain to climb at Horne Park last weekend. 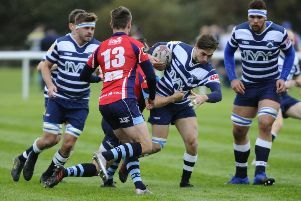 Falkirk took a sixth minute lead when scrum-half Fionn Call barged his way over from a five metre ruck near the corner flag following a lengthy period of pressure. Whitecraigs countered strongly and tries from Ross McDonald, Edmund Abekhe and Callum Innes had them ahead, with scrum-half Stephen Gillies converting two out of three attempts at goal. 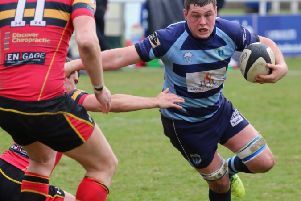 To their credit Falkirk countered deep into first half injury time when inside-centre Simon Rolleston crashed over from a ruck near Whitecraigs’ line, with Fionn Call converting both tries for a half time score of Falkirk 14 Whitecraigs 19. Taking the game to their opposition ‘Craigs opened the second period very powerfully indeed as their outside-centre Graham Murchie ran in a seemingly easy try under Falkirk’s uprights and Edmund Abekhe fielded the restart kick on his own 10 metre line and proceeded to outstrip Falkirk’s non-existent defence for his brace under the posts. Ewan Rooney went over for an unconverted for Falkirk, but yet again the visitors struck back with two further touchdowns from Gary Emans and Sean Callaghan, with Stephen Gillies converting all four second half tries. Falkirk competed to the final whistle and added two further tries from Andrew McNab and Connor Faulds.